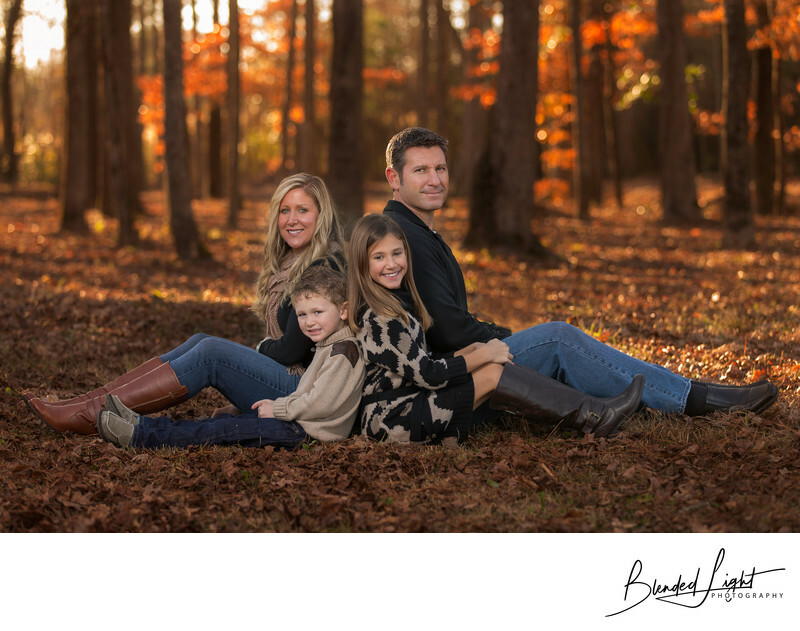 With the last of the leaves hanging on the trees and the gray of winter right around the corner, this late fall family session provided a great opportunity to maximize what was left of the fall color. As an added bonus, the trip to find the location was really simple - right at the end of the family's driveway. The last few rays of light from the fall sun were filtering through the trees and illuminating the leaves on the trees as well as the ones that had already fallen to the ground. Mom had asked for a picture of the kids in this pose, which we did, and then they hopped up. But before they could get too far, I suggested the family do it. With mom and dad seated, I put the kids in their places, but decided to flip them and put the taller daughter next to dad and mom and son together to ensure the image contained all their faces. It also helps the balance of the picture. The last step was using an off camera flash to light the subjects. For this shot, I used a shoot through 43" umbrella slightly left of the camera to bring the family's tones up, blending them nicely with the background. The family loved it and dad, in his infinite wisdom, had it printed as a large canvas for mom for Christmas! 1/80; f/3.2; ISO 50; 110.0 mm.